Stretchy jeans, like Old Navy's Rockstar Jeggings. They look good, but feel like a comfy pair of leggings. Compression socks, because they help reduce swelling in your legs and help prevent blood clots. Some airlines will actually give you a pair of plane slippers to use on board. But if they don't, I suggest brining slippers or slipper socks of your own (along with a little pouch to keep them in until you can wash them once you get home). As an added bonus, they help keep your feet warm, too! Does anyone else get grossed out by the poorly shrink-wrapped blankets that get handed out on most long-haul flights? They're always so static-y, and I'm always dubious about how clean they actually are. (And then of course there are those multi-hour flights where you don't get ANY blanket.) I recommend traveling with your own blanket, like this CoolMax blanket by Cocoon. I'm a big fan of Cocoon's products, and this travel blanket is small and lightweight enough to fit easily into any carry-on bag. You can never go wrong with a good pair of headphones on a long flight, whether it's to listen to music, to plug in to the in-flight entertainment system, or to drown out the noise of surrounding passengers. For some people, it's all about the noise-canceling headphones. Personally, I don't like noise-canceling headphones, and therefore have a nice pair of Bose over-ear headphones, which are really comfortable and still block out a decent amount of noise when I'm watching a movie or listening to music. I'm the unlucky type of traveler who has a ridiculously hard time sleeping on planes. It's usually a mixture of not being able to get comfortable, and too much going on around me. I've taken to traveling with an inflatable neck pillow for those times when I DO doze off, so I don't arrive in my destination tired AND with a crick in my neck. I like the inflatable pillows more than the memory foam ones because they're much easier to pack. To try to coax my body to fall asleep, I've invested in a nice eye mask and set of ear plugs. Sometimes it's just a matter of tricking your body into thinking it's bed time. You can find eye mask/ear plug bundles online – I personally like the ear plugs that mold into the shape of your ear. 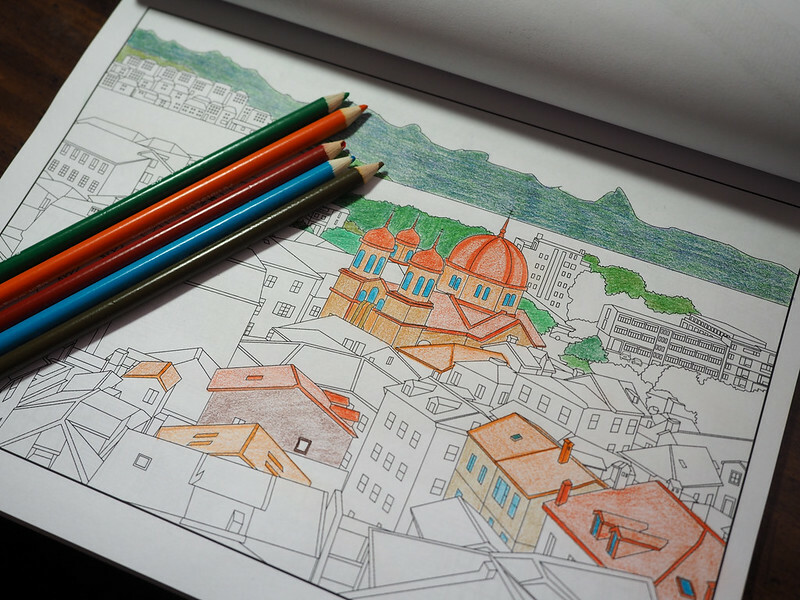 My pick is the “Travel Between the Lines” adult coloring book, which is a travel-themed coloring book designed based on actual travel photos taken by the travelers behind the blog WanderTooth. The story is cool, AND it's sure to stoke your wanderlust. Perfect for a long plane ride. Lastly, I never go anywhere without my trusty Kindle Paperwhite loaded with a few new books. If all else fails, I know I can always pass a couple hours by reading. The Kindle Paperwhite has a built-in backlight, too, so you don't have to bother your seat mate by turning on your overhead light after the crew turns all the main cabin lights off. Rachel (& Amanda) – try Bose in-ear noise cancelling headphones – much more comfortable than the big ones in my opinion. You don’t get the same pressure on your eardrums & if you wear glasses there is no “leakage”. Amanda, I had my audiologist office make me a set of in ear headphone “covers” they take an impression of your ear and have a mold made that allows ear buds to fit in and then the mold portion is what goes in your ear. They are really comfortable, I think I paid $30 for them and have had them for 3 years. Bonus is they fit well so the outside noise is reduced and you can actually have your music turned lower and reduce damage to your hearing. A definite plus! That, and you can totally put them on if you don’t really want to talk to the person next to you. Haha. Sometimes I’ll put headphones on when I’m feeling particularly antisocial!